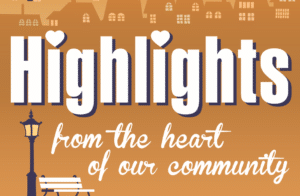 The show airing October 23, 2017 – October 30, 2017 ‘highlights’ the YWCA Sojourner’s Shelter Guys Night Out and Foodie Feast fundraising events. We interviewed Margaret Taylor, Program Director, Sojourner’s Shelter. Margaret discussed their purpose and mission. YWCA Sojourner’s Shelter for Homeless Women & Families provides emergency shelter and supportive services around the clock, every day of the year for homeless single women, women with children, men with custody of their children and intact families. This 75-bed facility offers a secure, healthy environment with crisis intervention, case management and counseling to help individuals achieve long-term self-sufficiency. They maintain a successful recidivism rate of about five (5) percent annually, well below the national average of individuals returning to shelters. Children’s programs include computer and art classes, tutoring, drug-free education, supportive counseling and field trips. Recovering from and preventing future homelessness is our goal for all who take shelter with us. They also operate the YWCA Sojourner’s Job Education/Readiness Center to provide education and job-readiness training for any and all homeless adults, regardless of their place of refuge. Margaret discussed the importance of Guys Night Out and Foodie Feast as critical to the day to day operations of the shelter. 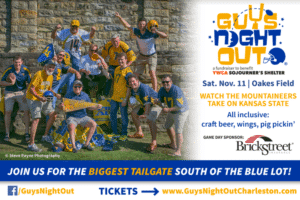 We talked with Jeff Sandridge, Co-chair, Guys Night Out committee. Jeff gave us all the details of the 12th Annual Guys Night Out event. 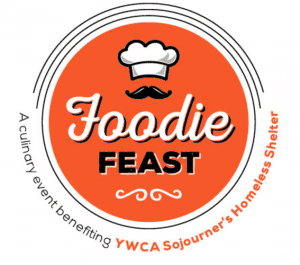 A gathering for ‘Guys’ organized by ‘Guys’ to benefit the YWCA Sojourner’s Shelter. This year the event is scheduled November 11, 2017 beginning 2 hours prior to kickoff of the WVU vs Kansas State game. New location this year includes Oakes Field in South Charleston. We also interviewed Kirsten Mork, Chair, Foodie Feast committee. Kirsten discussed the upcoming fundraising event scheduled for November 12, 2017 from 10:30 a.m. – 2:00 p.m. at Paterno’s at the Park in Appalachian Power Park. Charleston’s appetite for fun, funky holiday-inspired food with a ravishing new twist is truly insatiable! Don’t miss Foodie Feast—featuring the unique fusion of one-of-a-kind culinary creations with traditional comfort foods created by local celebrity chefs. Cocktails, too! You might even get some ideas to spice up your own Turkey Day.